PoultryNet® Electric Poultry Fence will keep most chickens and other non-flying poultry contained and protected from most ground predators including raccoons, coyotes, foxes, and dogs. This lightweight, mesh fencing is excellent for rapidly rotating poultry from one grass and/or garden area to another. It is quick to install, adjust or move. 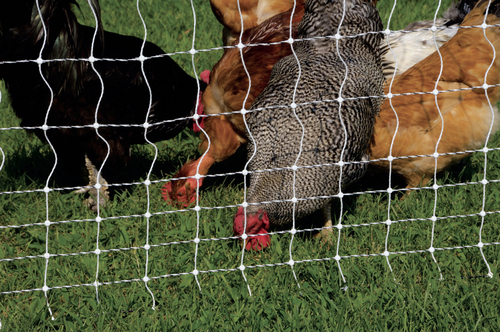 The close-spacing of the vertical and lower horizontal "wires" (2.5" x 3") provides both a physical barrier for your flock, and a pain barrier that repels most predators. We recommend using PoultryNet® Electric Poultry Fence with one of the fence energizers shown on this page. PoultryNet® Electric Poultry Fence: 164' long by 48" tall. Includes four corner/end posts. Energizer and Battery Power Package: Includes Energizer, battery, and Fence Tester. Can energize up to three 164-foot rolls of fencing. Plug-In Power Source Package: Includes 110 Volt "Plug-In" Energizer, ground rod and clamp, 100-foot insulated galvanized steel wire, and Fence Tester. Can energize up to three 164-foot rolls of fencing. Requires a 110 Volt power source. 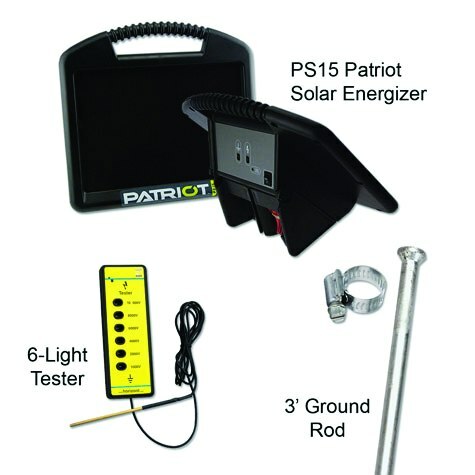 PS15 Patriot Solar Energizer Kit: Includes one PS15 Patriot Solar Energizer, one 3-foot ground rod and one 6-light tester. 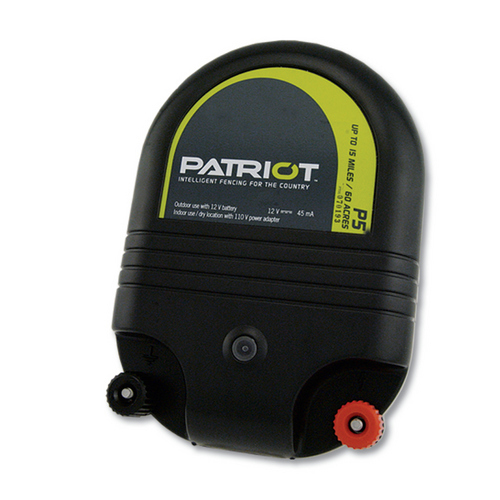 NOTE: the PS15 Patriot Solar Energizer Kit is for normal PoultryNet® Electric Poultry Fence installations of two nets or less. If more than that — or if you have dry, sandy or rocky conditions — you may need an additional energizer. Conductors: Prefabricated 48” tall netting of 12 poly-wires. 1 - 164 ft. roll. Line Posts: Prefabricated string verticals every 3” and plastic posts built-in every 12 ft.
Corner/End Posts: PowerPosts or FiberRods. Energizer: Allow 0.2 joules of output for every 3 nets. Windup System: None needed. Folds and unfolds as a package. Gates: None needed. Opens easily at any end or connection. Other: Do not use to fence turkeys. what if i don't need all 164 feet of fencing? Maybe i just need half. Why can't you use it with turkeys? Not recommended for turkeys, as they are not smart enough to move away from the fence. Does ps15 solar energizer kit have a battery included or is additional purchase of battery power package necessary? Yes, the solar energizer includes an internal battery that recharges by solar power. There is no need to purchase the battery power package. cat # 5PF-1, how long is this fence? how tall is this fence? Can I get extra polls and how much are they? ELECTRIC POULTRY FENCING: 164' long by 48" tall. Comes with 4 Corner/End posts.